My goals: Create automated income so that I am independently wealthy and enjoy my life passionately. Within three years, he’d built his own business and achieved those goals. At this point he set about helping his coaching clients do the same. Leveraging his knowledge and experience, they were able to make more money while reducing their work hours significantly. This freed them up to spend more time living. Stressed out and missing out on precious time with family and friends. If you want to build a business that gives you financial peace of mind while allowing you to enjoy life now, not later...Work Less, Make More will get you on your way. It will help ensure the business you're building will work for you, not the other way around. 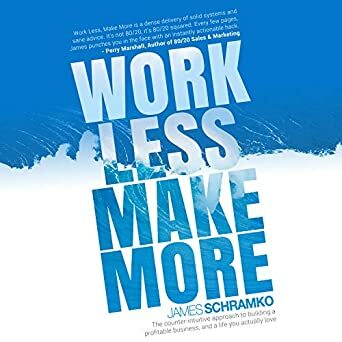 The book Work Less Make More by James Schramko is a wakeup call to any of us caught in a job or business that may appear to be going well, but in truth is preventing us from living a free and fulfilling life. Through his personal story the author explains how it’s possible for anyone, with the right attitude, to follow in his footsteps and build a multimillion dollar business while still having time for doing the things they enjoy. This book does not contain motivational fluff. Each chapter sets out practical strategies for building a business while avoiding the traps of work-overload, time-poverty and burnout. The information is organised well and straight-to-the-point. The summary of “Action items“at the end of each chapter makes the author’s advice easy to review and implement. It would be good if there was more in-depth discussion of some points. However I guess that’s not the purpose for which this book was written. It’s clear that this is not meant to be another how-to book offering "good ideas" and academic theory. Rather I see it as a guidebook or blueprint (of sorts) that shows us how to build a successful business AND lifestyle, based on the author’s real life experience. If you are running your own business or would like to be, you probably need this book. 5.0 out of 5 starsThe Foundation for Online and Offline Business Success. Around 2008 I allowed James to access my PC remotely to work out some problems I was having with some website design software. He fixed it ... for free. A few months later he was introduced at a Seminar in Manly, Australia and as I was there I was able to thank him personally. I have followed his success and progress (evolution) from this past association with him. Since then he has obviously risen to prominence, as have many in internet based businesses. But in my opinion James is different. His experience and resultant success was learned in the real world so his online success has a solid foundation few others have, as well as a genuine Aussie honesty when it comes to value for investment. If there were a ladder of success and trust in this industry James would be on the top rung, with a (very) few others a rung or two below; then with a big gap to the next group of entrepreneurs. This book is a testament to his values and the reasons for the respect he has. Funnily enough he scares me. I fear his business sense is beyond me; and the time I have to commit to the type of coaching he offers is just not there, (although there are SO many free "gems" you get from just being on his email list). So I continue to whittle away at other more simple strategies for smaller scale successes while hoping to initiate some of the great wisdom in this book into my own little forays on the internet. Thank you for publishing this great "read" James so I can take some of its advice and improve the way I am doing things. I love James's attitude to work and how he breaks down what is important and what we should be focusing on to maximise the amount of money we earn from as little work as possible. From the first chapter on I thoroughly enjoyed the book and implemented his effective hourly rate advice immediately as well. It's refreshing to see the other side of the hustle mentality and the shift of how working harder and harder especially in today's day and age is no so smart. I gained a tonne of information and practical steps to follow and can already see an improvement in my daily work. No matter the level of business you run, this book is a must read . Thank you James! 5.0 out of 5 starsIf James can't get you on the right track to an online business with this book, pretty much no one will be able to. 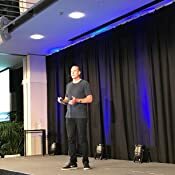 Just awesome practical advice and strategies that I have already been able to implement in my business and personal life - I love the way James uses stories from experience and is able to break the complex down to simple easy to use tactics and strategies. Sometimes ive found myself being completely overwhelmed running a business, wearing 1000 different hats, raising a family and trying to take on every opportunity or shiny object that comes my way. Through James teachings in this book and superfastbusiness Ive learnt simpler and a focus on only the most important right things is much better. Ive also been able to implement with my staff, helping them become much more effective which means everyone wins. 5.0 out of 5 starsAn easy to read, super practical, no fluff online business book. James Schramko is a fantastic online business mentor and role model. For many years James has provided me with significant inspiration and valuable knowledge for my own online businesses, mainly through his podcasts and live events. Finally James has distilled his teachings into an easy to read, practical, and super informative book. About time! I would highly recommend that anybody at any stage of the online business journey take the time to invest in this very practical, honest, no fluff approach to making money and building successful online businesses. I think I initially stumbled across this book on my facebook feed. Then I bought it the day it came out, read it that night and have changed my whole mindset on business and how I want to be doing things in the future. I'm from Melbourne, Australia and have even started surfing from the inspiration I have picked up from this book. As soon as my business ventures start showing some promise and my surfing skills improve, there is no doubt I will be catching waves with this bloke in due course.